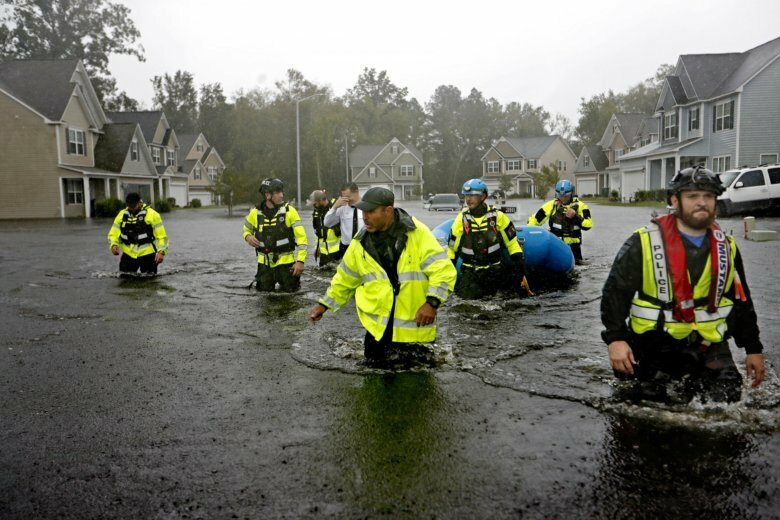 LUMBERTON, N.C. (AP) — Dams overflowed, dozens of roads flooded and whole neighborhoods were inundated as unrelenting rain from Tropical Depression Florence continued to fall over North Carolina. The flooding could worsen as Florence crawls westward, dumping more than 30 inches (75 centimeters) of rain in some spots since Thursday afternoon. Radar showed parts of the sprawling storm over six states, with North and South Carolina in the bull’s-eye. Many residents who stayed in their homes to ride out the storm now face evacuation orders because of rising flood waters, days after Florence made landfall Friday with 90 mph (145 kph) winds. Water on the Cape Fear River, which passes through Fayetteville, kept rising Sunday, reaching more than 41 feet (12.5 meters), according to the National Weather Service. Streams and creeks were running so high Sunday in the area around Charlotte, North Carolina’s biggest city, that the National Weather Service declared a flash flood emergency. Roads to Wilmington were cut off by the epic deluge and muddy river water swamping entire neighborhoods miles (kilometers) inland.